Mr Vassallo (centre) speaking at the PN press conference with, among others, Robert Cutajar (second from left) and Peter Agius (second from right). Maltese businesses are not making the most of potential EU funding opportunities available to them, the Nationalist Party said on Tuesday. Addressing a press conference, PN MEP candidate Peter Agius said that while 75 per cent of the EU’s funding budget was distributed by member states’ governments, the remaining 25 per cent was handed out by Brussels, and it was this batch of funds that Malta was not doing enough to tap. “Our success rate when it comes to tapping these so-called direct funds has been rather low, especially when it comes to financing projects for businesses,” he said. The PN announced proposals aimed at increasing the utilisation of these funds, ranging from empowering businesses to come up with projects eligible for funding, educational campaigns, and instructing MEPs to pile pressure on EU committees to adapt funding laws to the specific needs of Malta and Maltese businesses. Illustrating how, in his view, Maltese businesses are not doing enough to tap funding opportunities, Mr Agius said only five Maltese projects had applied for the EU’s SME Instrument, while similarly sized European regions had applied for more than double. Earlier during the press conference, MP Edwin Vassallo said that it had become clear from his visits to Maltese small and medium businesses that while it may be ‘the best of times’ for some - others were finding it hard to make ends meet. The Central Bank latest annual report, he said, had found that the retail sector and industry had edged down marginally. When it came to outlook, confidence was also an issue, he said. And while tourist arrivals were up, average spending in certain sectors was actually down. “So yes, it might be best of times for some - such as those in the construction sector, but the PN cares about those who aren’t doing so well, those who don’t fit in a pigeon hole,” he said. 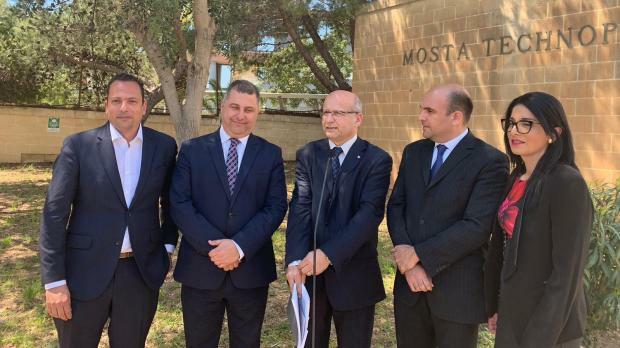 MP Robert Cutajar meanwhile, launched an appeal for the government to make the most of every cent of EU funding available to Malta. While the government had resigned itself to not getting as much in the upcoming EU funding allotment as previous administrations had done, the government should not forget about niche funding opportunities that could make all the difference, he said.